It's about that time to finally get out into the garden and pick that produce you've been growing all season long. I've put a lot of work into my garden this year, and have to admit that I am a little miffed since none of it seems near ready for picking yet, but my mom planted hers later than mine and is already enjoying the fruits of her labor. I am hoping that when we get back from Canada this weekend, I'll be pleasantly surprised that it magically sprouted a bountiful harvest. A girl can always dream, right? I doubled up on my cherry tomato plants this year because they are my favorite veggie. Or, have we decided they are a fruit? I'll grab handfuls of them throughout the day to snack on because they are just so darn good! Like I said, mine aren't ready to be plucked from the vines yet, so I've been stocking up on large containers when they go on sale at the market. 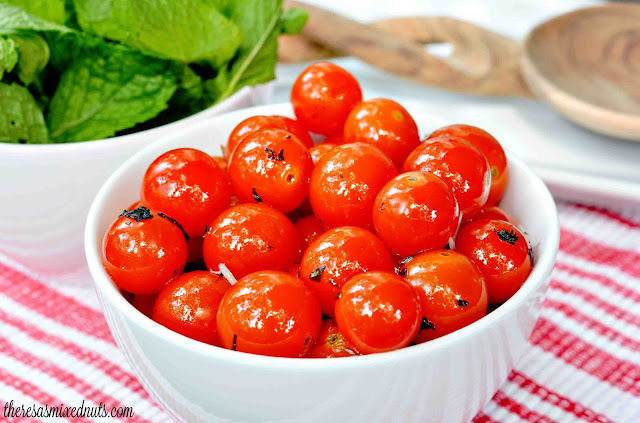 While I usually eat them cold out of the refrigerator, I wanted to try them warmed up for lunch yesterday and ended up making this Baked Minted Cherry Tomatoes recipe from Golden Blossom Honey. I love that most of the ingredients can be plucked fresh out of the garden, for a healthy and delicious lunch, side dish, or snack. What veggies did you plant in your garden this year? they do look nom! They terribly expensive here, compared to the regular tomatoes, so I can't say I eat them. I like yellow tomatoes too! I've seen yellow water melon (yellow inside) too recently in the shop, how positively novel! Hope you're relaxing in Canada! Don't you touch them, Dezzmeister. These are all mine. Now, THAT looks REALLY delicious. Ah-mazing. I need to make these asap! They sound wonderful. Bet they taste good indeed there at your feed. We just bought a bunch of heirloom cherry tomatoes from a local farmer's market. They would be perfect in this recipe. I wish we would have planted these cherry tomatoes. Isaak loves them! We planted 2 other types of tomatoes, popcorn, kale, potatoes, basil, oregano, banana peppers, strawberries and lettuce. I love, love cherry tomatoes. They make the best snacks but are much more expensive than larger, on the vine type. I catch them when they are on sale and stock up. What an interesting recipe idea I haven't thought of making cherry tomatoes like this before. Certainly worth at try! These look amazing! I've never had honey and mint with tomatoes before, but it sounds so good! Oh I love this! I think these would be fun to make. I'd love to have them as a side. I would have to say that baked or grilled tomatoes have the best flavor and I love to eat them. This is one recipe that I could really get on board with. Yum! Those look amazing! And they would be perfect alone or in many different meals, like salads! I love cherry tomatoes on my salad! This is another great way to enjoy them! Ohhhh, what a tasty sounding snack or side dish! Never thought to do this before! Yum! 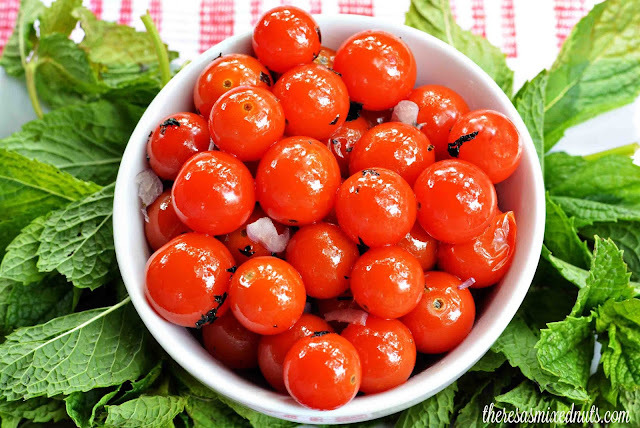 Growing up, I had a faux-grandmother (not actually related, but we cherished her) that ate cherry tomatoes with salt as her daily snack. Seeing this recipe brings back such happy memories! I like cherry tomatoes, they are so cute and explosives in the mouth. Nice idea for cherry tomatoes. Oh yum! These sounds so so delicious!! These look so delicious. I can not wait to make some. I have a small garden with tomatoes and squash growing along with some herbs. I never bothered baking them before and just eat them fresh. These would make great appetisers though!